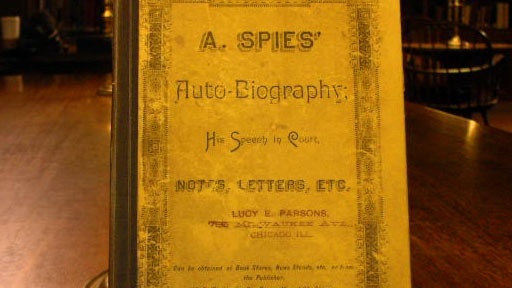 Amid the stacks at the Wesleyan University Library, a student has found a book emblazoned with the name and address of the legendary anarchist Lucy Parsons. The biracial black and Native American activist fought in the late 1800s for the rights of the poor and disenfranchised in the face of an increasingly oppressive industrial economic system. Did this once-feared radical own the manifesto? If so, it would pose a mystery: after Parsons died, police supposedly raided her house and confiscated all of her subversive literature. So how did this book elude them? History Detectives explores a major labor movement uprising and Parsons’ abiding acts of defiance. Also with Elyse Luray Broadway Ballet Shoes Did this dancer's great-great-grandfather teach Salvatore Capezio to make ballet shoes? Also with Elyse Luray Szyk Picture Could these be early drawings of America's most influential political cartoonist? Also in Industrialization: 1870-1900 Doc Holliday's Watch Was this watch a gift from the fearless frontier lawman Wyatt Earp to the gambler Doc Holliday? Also in Season 5 Dempsey Fight Bell Is this the bell that sat ringside at the world's first boxing superstar's legendary match? Also in Season 5 Pete Gray Cartoon Do these unsigned drawings from the golden age of comics tell the tale of a real life superhero?